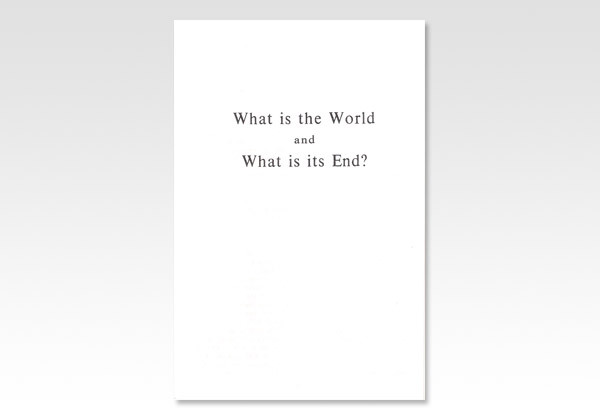 Believers Bookshelf - What is the World and What is its End? And first, What is the world? Men are apt to think that this world is as God made it, and that all things continue as they were at the creation, only that man has made great progress in prosperity and civilisation. Now, in material comforts, none will deny it, though the men of a past age would hardly think our refinements comforts; and, while passions subsist, the difference is not so great as is supposed. Men have telegraphs, railroads, Armstrong guns, and ironclads; but I hardly know in what respect they are happier for it. It is a question if they have not excited the passions more than they have satisfied them. Children are not more obedient, families not more united, servants not more honest and respectful, masters not kinder, wives not more faithful. Morally speaking, I do not see what the world has gained. It thinks better of itself, and vaunts its powers: I do not know that this is any advance. Christianity, as light come into the world, has made a difference. Men do not do in the light what they do in the dark. But if we look beneath the surface, even that is not much. But the world is in no sense as God made it. He overrules all, has patience with it; but He never made it as it is. He made Paradise, and the world has grown up as it is through man's departure from God. It has been destroyed once since, because of its wickedness. It is conscious at this moment that things cannot go on long as they are; that we are in a crisis of the world's history which must result in some great disruption. Some will tell us that democracy is the evil, and it must be put down; others, that it alone can save the world. But all feel things cannot go on as they are.